Adventure Motorcycle touring has gained popularity over the recent years, mainly due to the ability to carry all your camping gear on the bike. This has opened up the whole world to riders who want to explore remote areas without having to look for accommodation every night. Preparing for an adventure ride is something that is refined after plenty of trial and error experiences. After each trip, you learn what you should have brought, and what you really didn’t need after all. The length of the ride. How far will you be going on this trip, and for how long. The terrain. Will it be mainly off road, or an easy road touring trip. The expected weather conditions. Is it a summer or winter trip. Will you be carrying a pillion, or will they have their own bike? Start with making a list of everything that you need, then cut it down to what you can’t do without. The best way is to lay it all out on the floor or table. Then start to eliminate stuff. Be ruthless, ask yourself if you really need it. If you can cut 5kg – 10kg it will make a big difference on your bike. Weight severely affects the handling of your bike and can cost you cracks in the frame and increased wear on the shocks. Balance the weight from side to side, and front to back. Try not to have too much behind the rear wheel. It can make it dangerous to ride. 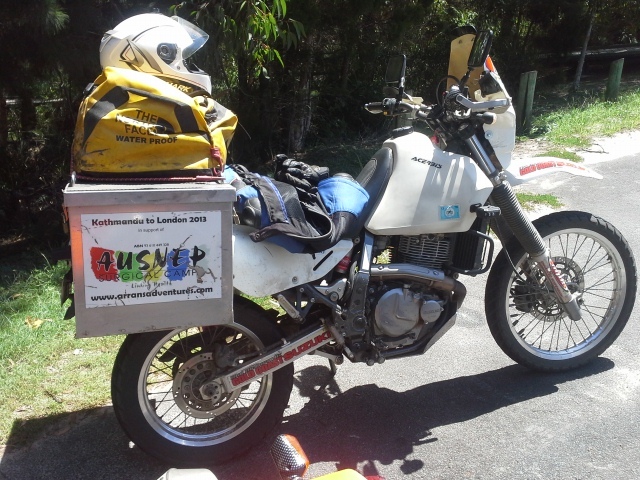 Try to place an even amount of weight in the panniers. It sounds obvious, but it seriously affects the handling of the bike. Pack the heaviest stuff as low as possible in the panniers. It helps keep the center of gravity of the bike low, which helps the handling. The important stuff goes on the top. Think about what you will be needing during the day. Leave extra space for things you may be buying along the way. Use a Tankbag for the most important stuff like wallet, cameras, phone, passport, maps etc. 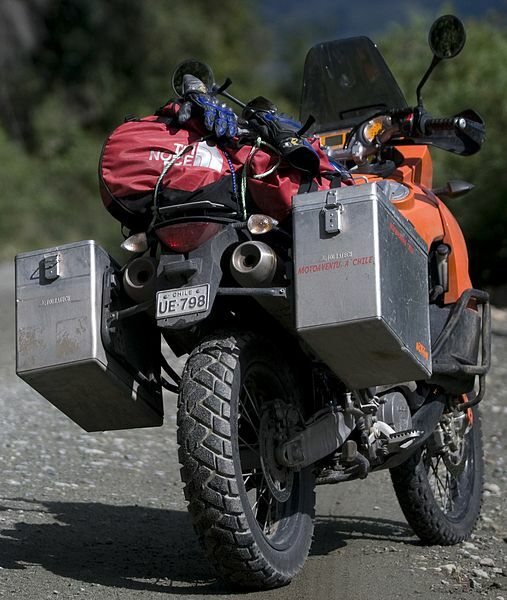 Your Tank Bag can easily come with you if you have to leave the bike unattended for a while. You need to provide space in your luggage for your toolkit, (if it’s not a Bum Bag) and also some extra space for things like spare tubes, tire repair kits, pump, towing straps and tie downs, extra oil (engine and hydraulic), portable charger. Be prepared to do some trailside repairs if necessary. 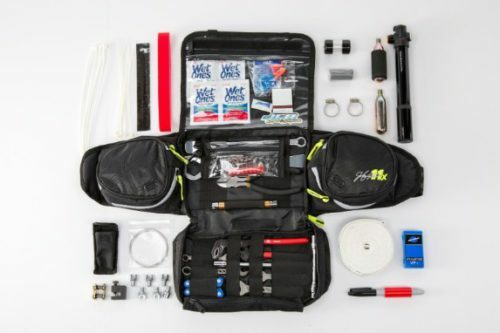 Every type of bike has its own specialized needs, so when you pack a toolkit, pack it for YOUR bike. Below is my list I have developed over time. Please feel free to add any suggestions to the comments below. Chain Lube: The off-road non-flick type is the best. Spare chain links: Carry a couple, plus a short length of chain 4 or 5 links can be useful. Chain breaking tool: The compact type is best as it takes less space in your kit. Siphoning hose: Or spare fuel hose is handing if one bike runs out of fuel on the trails. Rubber gloves: Handy for doing dirty work like chain repairs or oil filter. Using rubber gloves means you are not sliding dirty hands into your riding gloves. WD40: Useful for anything that doesn’t move and should, or for helping with a drowned bike. Tow Strap: Never go bush without one. Wire: Always handy for some bush repairs. Duct & electrical tape: You can hold almost anything together with duct tape. Jumper leads: Most times you can bump start your bike, but not in the deep sand. Hose clamps and rubber bands: Tough rubber bands can be made by cutting sections of old inner tubes. Spare screws, bolts, and washers: Specific for YOUR bike. Cable Ties: Small and large. If you get a flat tire, 4 or 5 large ties around your tire and rim will be enough to get you a short distance if you don’t have a spare tube. Puncture repair kit: A bicycle tire repair kit is sufficient. Always check the glue as it dries out after being opened once. C02 cartridges and adaptor: Carry a few of these. Small pump: Double acting pumps are best as they pump with every stroke. Small & large tire levers: Tyres can be changed with the small tire levers, but if you have room a couple of larger ones make the job easier. Tyre pressure gauge: I usually run at about 12-16 psi. The rougher the terrain, the higher the pressure. It reduces the chance of puncture but does make the ride a little rougher. Spare inner tubes: Inner tubes be carried in a special bag on the front mudguard if you don’t have panniers. Allen keys: I pack just the ones my bike needs. Shifting spanner: A small crescent spanner is sufficient. Sockets and rachet spanner: 6,8,10,12 mm will fit most bolts on your bike. If you do your maintenance at home from what’s in your kit, you will know exactly what you need. Spanners: 8,10,12,15 & 17 seem to be most common. Also, a spoke spanner. Vicegrips: Great little vice for trailside work. Leatherman multi-tool: There’s a wide range available. The ones with fine nose pliers and scissors are great. Spare air filter: Pre-oiled and kept in a zip-top plastic bag. A must if you get drowned in a stream crossing. Spare headlight bulb: If you plan on riding at night, it can be a lifesaver. Small Medical Kit: Always best to have it and hope you don’t need it. Although you will be wearing all of your usual gear, it is a good idea to double up on some things depending on the weather conditions and temperatures you’re likely to encounter. It’s a good idea to carry a spare set of gloves in case you get wet, and a pair of rubber gloves for under your riding gloves if temperatures drop. A spare pair of socks is a good idea if you encounter any stream crossings. A spare pair of goggles, or visor cleaner if you don’t use goggles. 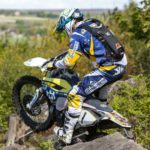 A Hydration Pack is great for off road and on road riding. No more interrupting your riding to take a drink. Hydration Pack Comparison – What Type is Best For You? This is entirely up to you depending on the length of the ride and other activities you will be doing along the way. It is a good idea to have a fresh set of clothes for each day, and separate them in zip lock bags, and just reuse that day’s bag for the previous day’s dirty clothes. You’ll also want to take a set of leisure clothes for the evening sitting around the campfire, heading into town, or whatever activities you have planned. This would include a t-shirt, shorts, jeans, sandals or shoes, swimming gear, and a towel if there’s a lake nearby. You’ll also need your minimal toiletries like toothbrush, toothpaste, deodorant, towel, wipes etc. Again this is entirely dependant on the length of your ride, and how isolated you will be. Freeze dried or dehydrated foods are easy to pack and prepare. Cup O’soups, noodles, rice, baked beans are easy to pack and can be easily prepared. Pack enough water for drinking, cleaning, cooking. Also make sure you bring the necessary utensils, lighters, matches you will need for cooking and eating. Whether you’re spending a week or a weekend under the stars, the following items will be essential for your camp. Tent: A 2 or 3 person dome tent folds down very small. 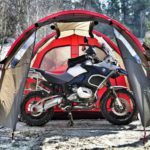 A backpackers tent is ideal because of it’s light weight, but there are now tents designed specifically for motorcycle camping. Sleeping Bag: The type depends largely on the temperatures you’ll encounter. Sleeping Pad: Hikers self-inflating sleeping pads are the trick. A thickness of 50mm is pretty standard. They are light and roll down into a small package. Folding chair: Smaller and lighter the better. Gas cooker & lighter: There are many to choose from. Headlamp. When you need both hands free to work on your bike at night. There’s a huge range to choose from and they’re a pretty cheap item. Packed and set to go! 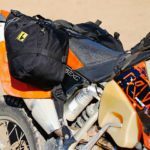 I hope this post gives you a few ideas as to the essential items you’ll need for your next Adventure Motorcycle camping trip. If your bike doesn’t have fixing points for racks to fit a hard luggage system, soft panniers may be the solution. 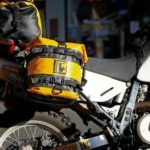 Soft Motorcycle Pannier Review – The Dual Sport Solution? If you have any thoughts on what you have found useful on your own trips, please feel free to add your comments below. Hello and thanks for sharing, a trip like this seems to be very exciting and full of so much adventure. 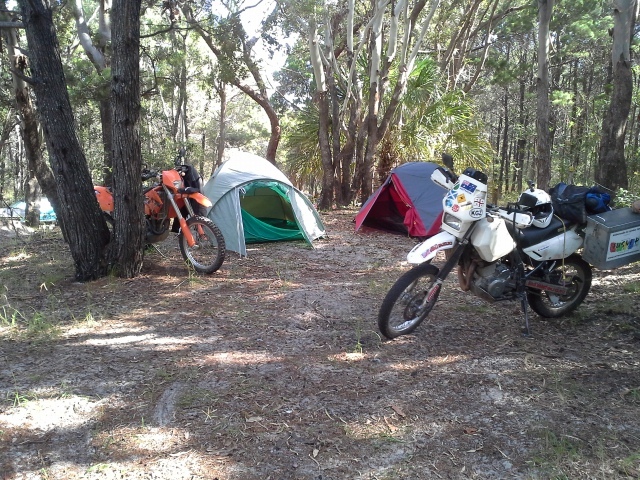 This is the first time that I have heard going on a camping trip on motor bikes but this seem to also be fun. For those who are engaged in this kind of activity they will love what you are sharing and the ideas that you are giving is such a great help. Thanks for your comments Norman. 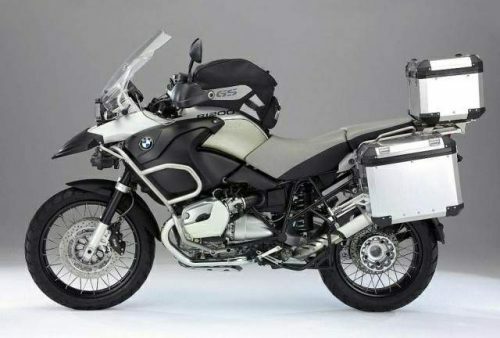 Adventure motorcycle camping and touring is becoming increasingly popular. It allows you to get to places that other off-road vehicles can’t, while enjoying the freedom and thrills of riding a motorbike.